As part of a developing relationship between CHM and Health Exchange, the two organisations have worked together to provide an internship programme for CHM's doctoral students who are completing their researches and would like work experience in a sector where they may start their careers. It is of particular benefit for those students whose interests include public health policy and/or the role of NGOs, and the voluntary sector's engagement with the general public on various health issues. The first intern is Tom Bray, who will be spending 30 days in the workplace over a three month period October-December 2015, contributing to Health Exchange's activities and learning more about how it operates. One of Tom's achievements during his internship will be the organisation of a public event on diabetes. It will take place in central Birmingham on the 10th December. Further details and booking are available at Eventbrite. 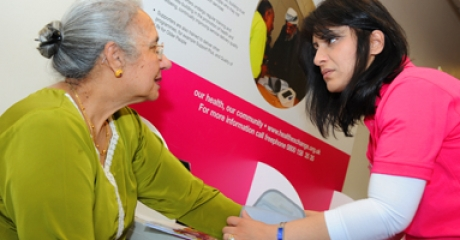 Health Exchange has been promoting health and wellbeing and tackling health inequalities since early 2007. Its mission is to support people in the West Midlands to make informed lifestyle choices that improve their health and wellbeing, and to tackle health inequalities. It is a social enterprise rooted in the areas where it works, employing people from local communities, and with established, trusted relationships that are sensitive to local needs, cultures and customs. Its services focus on two key aspects of health: promoting healthier lifestyles and managing long-term conditions more effectively. It provides and develops services on behalf of the NHS, PCTs, GPs, local authorities, private companies and other bodies throughout Birmingham, Dudley, Sandwell, Solihull, Coventry and Telford. A Health Exchange employee performs a blood-pressure check.